Neil joined Watford in their debut season in the Premier League in late 2001 having played against the Hornets in the Play-Off Final earlier in the year. Despite a spell on the transfer list under Gianluca Vialli, he forced his way back into the team and became Club Captain during a rocky financial period for the club. Now Assistant Manager at AFC Wimbledon, Neil spoke to Watford Legends in 2009 while he was living in Portugal. Hi Neil. How did your move to Watford come about? Bolton had played Watford in the play off final, as I’m sure you know! Over the few months following on from that I knew from an agent that Watford were looking. I was happy to stay at Bolton and fight for my place though. Then Colin Todd got the sack, Phil Brown came in and only got five games and then big Sam came in. They needed some money to re-invest in the squad, and then I got a phone call to say they had agreed a deal with Watford and I came down the same day and met Graham Taylor. That’s how it all started. I settled in fine. Charlie Miller had just signed as well so there was two of us in the hotel which made it a lot easier to settle in. The lads made me feel really welcome. Obviously I got a bit of stick early on because of the play off final when Wrighty scored his fluke goal! It was good banter at first and everything went well. Being a northern lad, did you find the culture much different down here to any of your other clubs? No not really. People talk about this north south divide but it never really bothered me. Footballers are footballers; we just get on with it! I had already moved about a fair bit by then so I was used to having to try and adapt and settle in. As soon as you get settled in and get your family down it is easier. How long did it take to move your family down from the North West? They came down quite often and saw me at the hotel. Within about six weeks of signing we had found a house and we had moved in before Christmas which was great. We lived in Bushey and really enjoyed our time there. One stat that did surprise us was that you made more appearances for Watford than any of your other clubs. Yeah it seems strange in a way; I think it was about 250 appearances. It just all went well, the wife and my eldest daughter got settled in straight away, and to be honest we didn’t really want to leave but due to football managers changing sometimes you are left with no choice and have to move on, that is the nature of the game. Do you have any particular games that stand out as a favourite for you in your time at The Vic? After what had happened with the finances, the game where we played Sheffield United away sticks in my mind. Ray Lewington just put a team out without knowing how we would react, but we reacted in a professional way and we won the game. The club was dead and buried with the fans and it was disappointing, so it was nice to go out and get a result for them. How did you enjoy playing under Ray Lewington in your time at Watford? I enjoyed it. I think it is fair to say I was one of Ray’s favourites. It was difficult for him though. After me and the chairman fell out, Ray offered his resignation as they were beginning to have fall outs about me. Luckily enough he kept his job but I don’t think it was too long after that he went. I got on really well with Ray though; I thought he did a fantastic job. All the managers I played under there got money to spend but he got absolutely nothing. It was disappointing, but Ray managed to see out the season and we had a good cup run but finances were short and he was getting no help. Is it fair to say that the biggest games in your time at the club were the double header against Liverpool? It was fantastic for the club. We knew it would be difficult going to Anfield and we knew we had to keep it tight and we did. Obviously my own goal didn’t help! That wasn’t my first and definitely wasn’t my last! When we got them back at The Vic it was disappointing not to get the penalty when Bouazza got tripped in the box. It’s tough going in the changing room and seeing that it should have been given. Going in 1-1 against Liverpool with 45 minutes left to play you never know what could have happened. We didn’t play well in the last 20 minutes though, we should have done better. 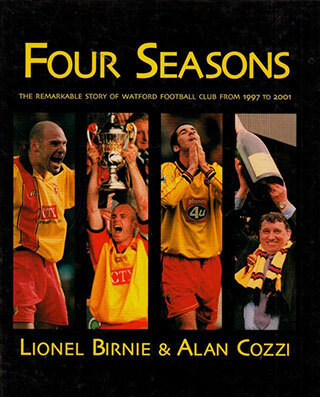 But overall it was great, and certainly good times to play for Watford. To go back a bit before that, as an experienced pro could you see the iceberg coming when Vialli came into the club and started to throw loads of money around? To be honest, I was one of the players that he didn’t really want. It was difficult. I still speak to Luca now. He never spent the wages. He was asked for a list of players that he would like to see at the club, and the club went and got the top people on the list. He never got involved in the money side of things. It was the club that agreed the transfer fees and the wages, but Luca got a lot of stick for that. He never paid the wages though; I think he got bit of a rough ride by the club on that one. Ramon Vega got given a three year deal on £20,000 a week and the club let people believe that it was Luca that had done that deal, but he didn’t have any say so over the money side of things. The club was giving out some ridiculous contracts and paying people money they should never have been given. You were there for the early part of the Boothroyd regime as well, how was that? Boothroyd had already been given the job before Ray even got sacked. He watched Ray’s last two games in charge, so we knew he was coming in. He came in and called a meeting and basically said, ‘I’m Aidy Boothroyd, Coxy I want you in my office now’. So I went to his office, and he told me he knew about me and the chairman not getting on but that would have no effect and that he was the man that picked the team, not Simpson, and that I was part of his plans. I barely played after that! It was quite peculiar. He was the chairman’s man though. I played until the end of the season. At the end of that season, I still had 1 year left on my contract. I was told to come in and fight for my place, and that I would still be involved. The first day back in preseason, I was put in to train with the kids and told that they wanted to let me go, and that I wasn’t really welcome at the club anymore. So I trained with the kids for the first 3 weeks and that was it really. It was only if we had injuries or suspensions that I would get a game, and as I was contracted to the club I would always do my best. But as soon as someone got fit or finished there suspension I was back out of the frame. From Watford you went over to Cardiff, how was that? Yeah I went to Cardiff for a year, they rung to see if I would go and help them out which I had no problem with. It was a great club to play for; despite all the rumours they had financial problems. The atmosphere around the place was fantastic. A long way from home for you though? Yes it was. We never really wanted to leave Watford. I tried getting a club in London which was difficult. My eldest was settled in school and my youngest had just been born in Watford. But with the nature of the game we had to leave Bushey and move house. I told the club I wanted to stay and fight for my place, but it was made 100% clear I wasn’t wanted at the football club. What made you decide to finally hang up the boots? In the last 18 months or so at Crewe they were playing me in the middle of midfield with a lot of young players. There only interest was in bringing young players through and helping them, it was like babysitting really! I found it quite difficult by then. They didn’t want me training every day, but all I had done for 20 years was go into training every day and working hard. They wanted me to take my foot off the pedal and just turn up on the Saturday which I wasn’t really interested in. Were you not tempted to try and find another club after Crewe? I had a shoulder operation at the end of the season, and applied for a few managers positions. I got to the latter part of the interview stage with a couple of clubs and decided that was the way I wanted to go. I wasn’t far off getting the managers job at one unnamed club, and also Port Vale but nothing came off so we decided to take a year out and get some sun, so that is what we are doing at the moment. So what are you doing day to day now? Playing a lot of golf! I am also in the middle of building a new villa. I bought one to knock down and re build from scratch to then sell on. The family have settled in really well. The kids are in an international school and are taking Portuguese lessons. All my family are happy, so life is good. Where do you envisage yourself being in a few years time? Still in the game maybe? I still know a lot of people in football, and have been told that there are jobs waiting for me whenever I am ready at certain clubs. I have done a little bit of scouting in Portugal for one or two clubs that have played European games out here, a couple of premier league clubs have asked me to look at certain players. I still play a bit of football out here with a local team as well. What is the biggest home comfort you are missing whilst out there? Nothing at all so far to be honest, I miss the football a little bit but I still have a bit of banter with the lads I play with out here. I am definitely not missing the weather! Are you still in touch with any old Watford boys from your time? I speak to Kevin Hitchcock twice a week, Neal Ardley pretty much every other day as well. I also still speak to Gavin Mahon, Sean Dyche, Marcus Gayle and Alan Neilson every now and then. Ok well hopefully see you back at The Vic soon.